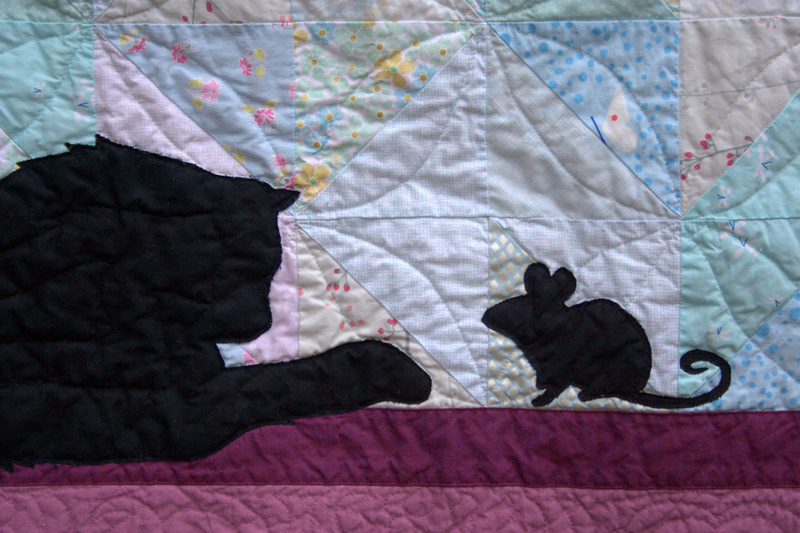 The quilt turned out so beautifully, Kitty! You nailed the cat silhouettes from the beginning, honestly, although it was fun to get to play guess the behavior with you. 🙂 I love the large mod flower quilting, it’s a really fun motif. I also have this great video image in my head of my own husband trying the jump technique – large quilts can be really tricky to photograph, can’t they?! Your Grand Dude is the best of husbands, has a wonderful imagination, and great confidence in your abilities Kitty! And you came through for his Princess in a beautiful way! 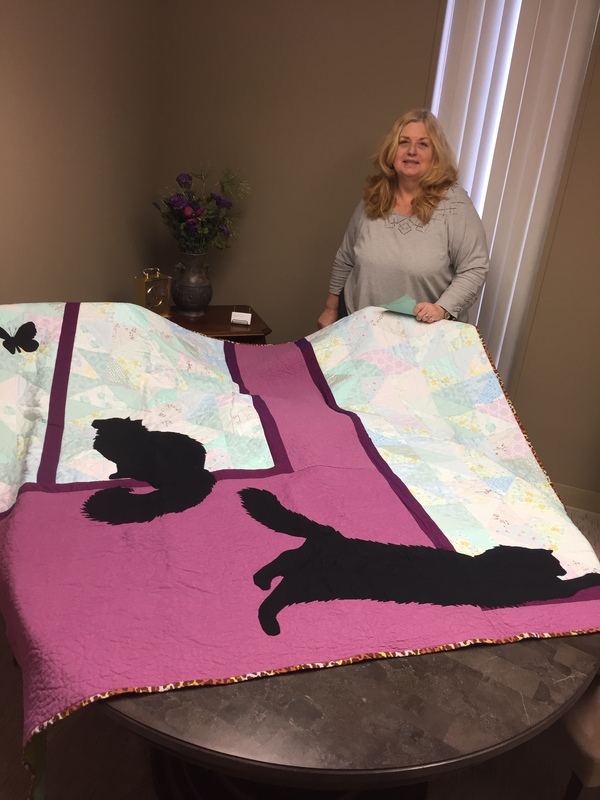 What a sweet and very well thought out quilt! I really love the window pane piecing you did, it reminds me of sunlight dappling through leaves. 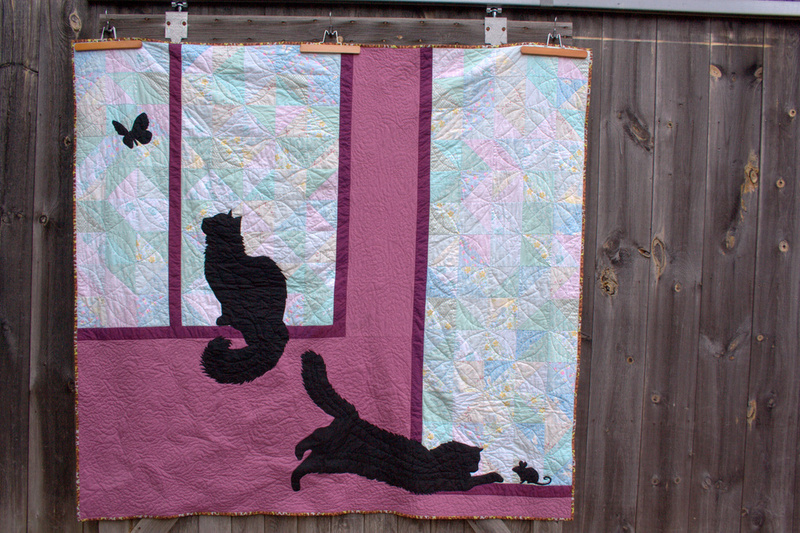 This is such a cute quilt and you did a fantastic job with the quilting! Wow. Really cool. Both the story and the quilt. And the quilting too, the back looks fab! That’s really lovely! 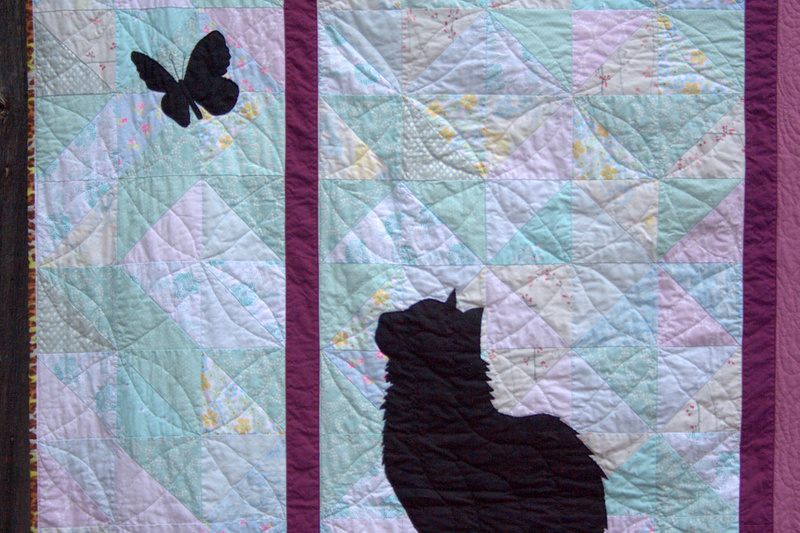 Now I want to make a silhoucat quilt. The big question is how did you price it. You don’t have to answer, of course, but I’m always a bit curious how others do it. Do if you don’t mind sharing a bit… did you estimate cost ahead of time? Charge for actual time once it was completed? Just triple material cost (that’s what someone recommended I do). Charge just for materials, since it was for a family member? Thanks! Kitty, fantastic job! Such a great idea your FIL had to keep the kitties busy, one with a mouse and the other with a butterfly. Thank you showing us your design from EQ7. 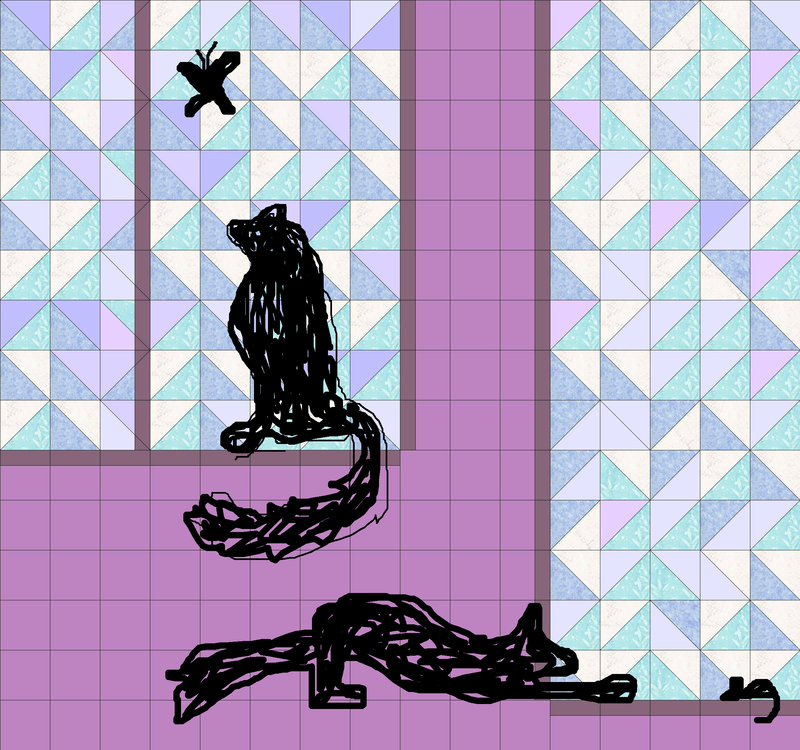 Your freehand kitties are quite good! Beautifully done! I think the mouse is what makes it for me! 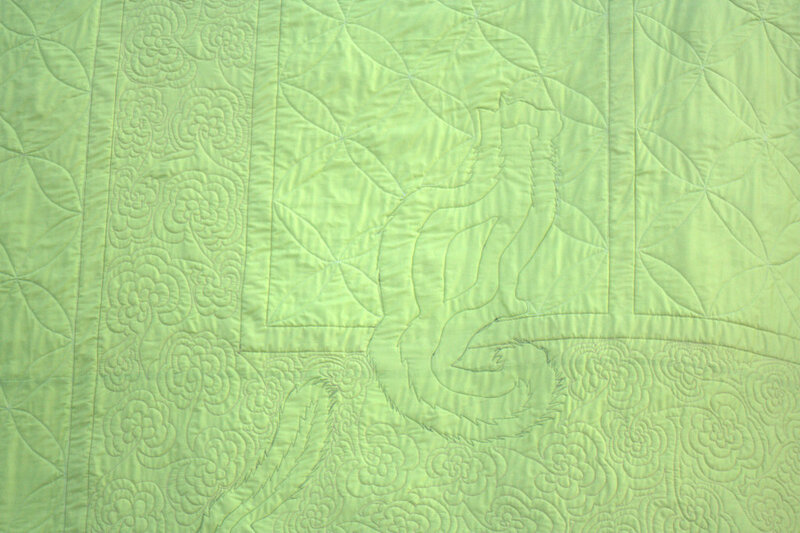 Love how this turned out and your quilting is so wonderful. Too cute! This looks awesome. Wow Kitty! There is so much great detail here. Your orange peel quilting is excellent!! Also, the pocket as the label is genius. It looks like it is well-loved! Congrats! 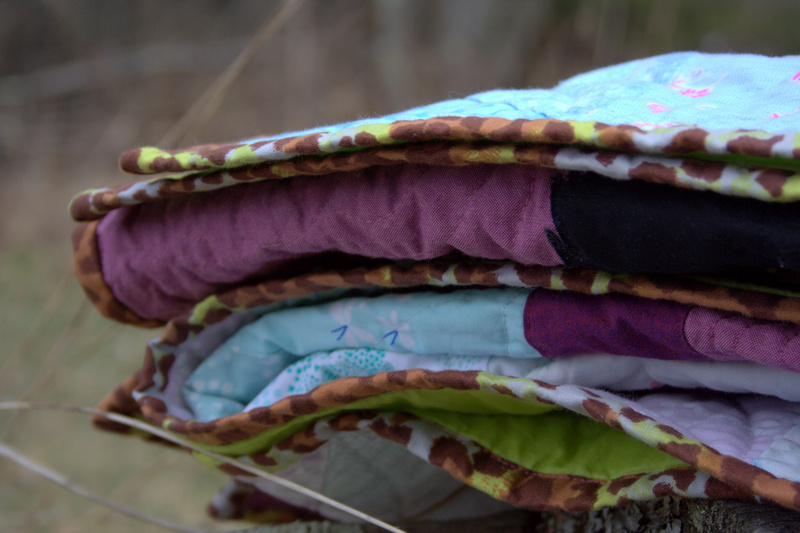 What a delightful quilt–truly tailored to the recipient. The kittens look so believable! 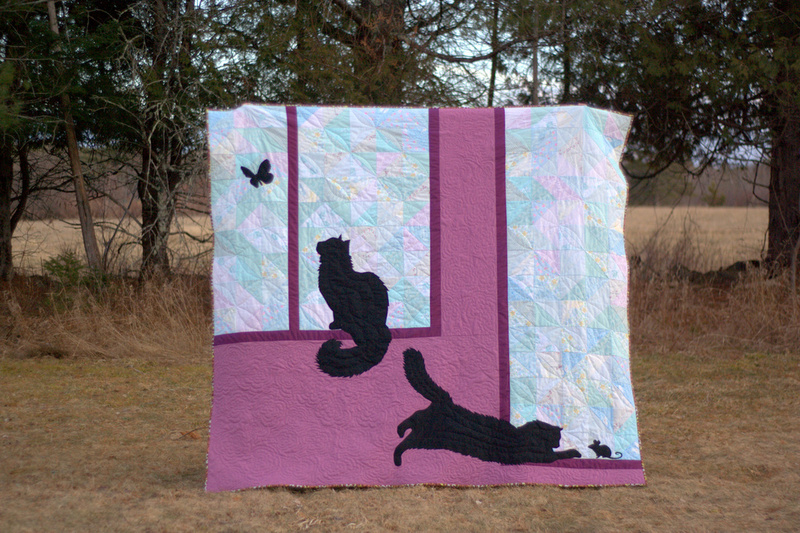 Like others, I love the piecing of the window–just enough interest in the background without detracting from the kittens. Just lovely! Although you had put the dimensions in at the top of the post I still didn’t really appreciate the size until the last photo – wow!! Wow. It’s amazing. Awesome job. 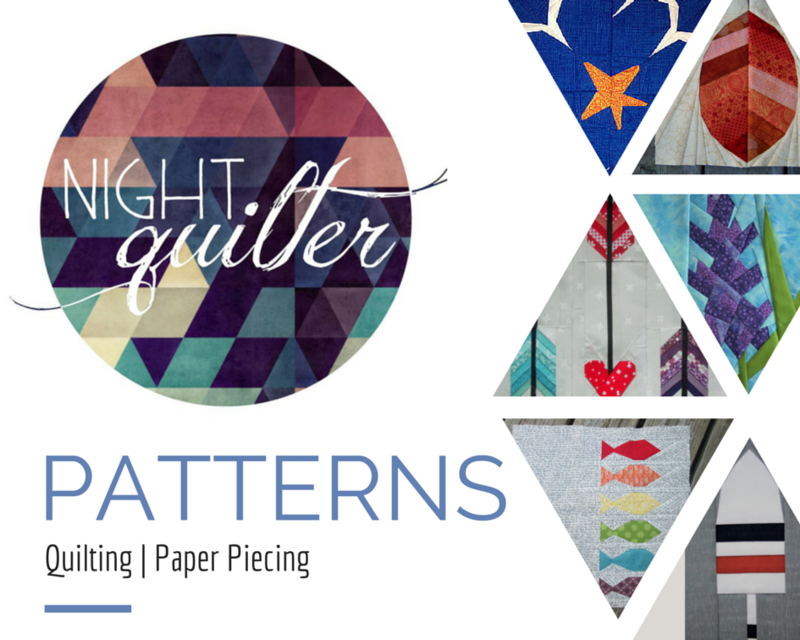 Beautiful Quilt – very original and fun!